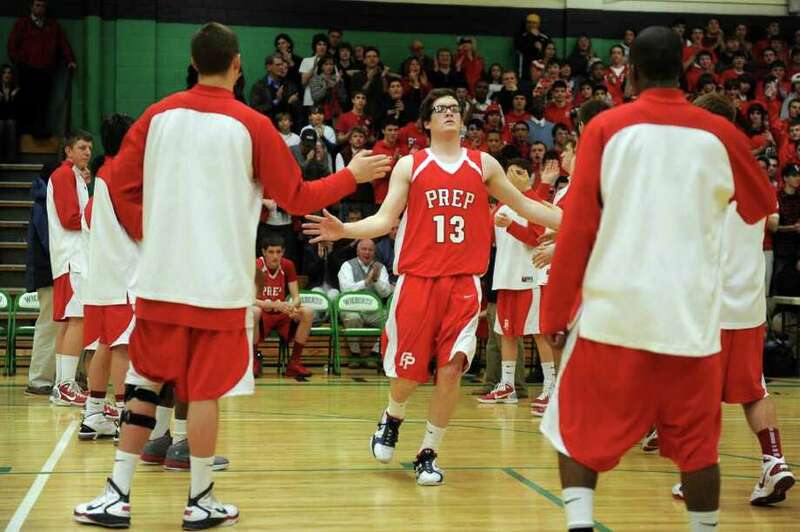 Fairfield Prep's Kevin Potter is welcomed to the court during Tuesday's class LL semifinal game at Wilby High School in Waterbury on March 15, 2011. Fairfield Prep gets excited before Tuesday's class LL semifinal game at Wilby High School in Waterbury on March 15, 2011. Fairfield Prep Terry Tarpey is welcomed to the court during Tuesday's class LL semifinal game at Wilby High School in Waterbury on March 15, 2011. Fairfield Prep's Robbie Bier is welcomed to the court during Tuesday's class LL semifinal game at Wilby High School in Waterbury on March 15, 2011. Ridgefield's Jeff Racy pulls down a rebound during Tuesday's class LL semifinal game at Wilby High School in Waterbury on March 15, 2011. Fairfield Prep's Matt Daley takes a shot during Tuesday's class LL semifinal game at Wilby High School in Waterbury on March 15, 2011. Fairfield Prep's Matt Daley takes a shot as Ridgefield's Jeff Racy, left, and Seth von Kuhn, center, defend during Tuesday's class LL semifinal game at Wilby High School in Waterbury on March 15, 2011. Fairfield Prep's Robbie Bier is fouled by Ridgefield's Bryan Galvin during Tuesday's class LL semifinal game at Wilby High School in Waterbury on March 15, 2011. Ridgefield's Seth von Kuhn takes a shot during Tuesday's class LL semifinal game at Wilby High School in Waterbury on March 15, 2011. Fairfield Prep's Kevin Potter takes a shot as Ridgefield's Jeff Racy defends during Tuesday's class LL semifinal game at Wilby High School in Waterbury on March 15, 2011. Fairfield Prep's Kevin Potter takes a shot during Tuesday's class LL semifinal game at Wilby High School in Waterbury on March 15, 2011. Fairfield Prep's Matt Daley dribbles during Tuesday's class LL semifinal game at Wilby High School in Waterbury on March 15, 2011. Fairfield Prep's Matt Daley takes a shot as he is called for an offensive foul against Ridgefield's Chris Esemplare during Tuesday's class LL semifinal game at Wilby High School in Waterbury on March 15, 2011. Fairfield Prep's Robbie Bier takes a shot as Ridgefield's Bryan Galvin defends during Tuesday's class LL semifinal game at Wilby High School in Waterbury on March 15, 2011. Fairfield Prep's Terry Tarpey takes a shot as he is defended by Ridgefield's Mike Kenny during Tuesday's class LL semifinal game at Wilby High School in Waterbury on March 15, 2011. Fairfield Prep's Kevin Potter passes the ball during Tuesday's class LL semifinal game at Wilby High School in Waterbury on March 15, 2011. Fairfield Prep's Robbie Bier scores three points during Tuesday's class LL semifinal game at Wilby High School in Waterbury on March 15, 2011. Fairfield Prep's Nick Hoin takes a shot as he is fouled by Ridgefield's Jack Heller during Tuesday's class LL semifinal game at Wilby High School in Waterbury on March 15, 2011. Fairfield Prep's Leo Redgate coaches his team during Tuesday's class LL semifinal game at Wilby High School in Waterbury on March 15, 2011. Fairfield Prep's Terry Tarpey looks to pass during Tuesday's class LL semifinal game at Wilby High School in Waterbury on March 15, 2011. Ridgefield coach Carl Charles talks to his team during Tuesday's class LL semifinal game at Wilby High School in Waterbury on March 15, 2011. Ridgefield's Chris Esemplare dribbles during Tuesday's class LL semifinal game at Wilby High School in Waterbury on March 15, 2011. Ridgefield's Bryan Galvin dribbles the ball during Tuesday's class LL semifinal game at Wilby High School in Waterbury on March 15, 2011. Ridgefield's Bryan Galvin is welcomed to the court before Tuesday's class LL semifinal game at Wilby High School in Waterbury on March 15, 2011. Ridgefield's Kurt Steidl keeps the ball in bounds during Tuesday's class LL semifinal game at Wilby High School in Waterbury on March 15, 2011. Fairfield Prep's Matt Daley is fouled by Ridgefield's Jack Heller during Tuesday's class LL semifinal game at Wilby High School in Waterbury on March 15, 2011. Fairfield Prep's Robbie Bier takes a shot as Ridgefield's Chris Esemplare defends during Tuesday's class LL semifinal game at Wilby High School in Waterbury on March 15, 2011. Ridgefield's Chris Esemplare takes a shot during Tuesday's class LL semifinal game at Wilby High School in Waterbury on March 15, 2011. Players on Ridgefield's bench react as their team falls behind during Tuesday's class LL semifinal game at Wilby High School in Waterbury on March 15, 2011. Ridgefield's Kurt Steidl takes a shot as Fairfield Prep's Alex Heiman defends during Tuesday's class LL semifinal game at Wilby High School in Waterbury on March 15, 2011. Members of the Fairfield Prep basketball team cheer during Tuesday's class LL semifinal game at Wilby High School in Waterbury on March 15, 2011. Fairfield Prep players react to winning Tuesday's class LL semifinal game at Wilby High School in Waterbury on March 15, 2011. Fairfield Prep's Matt Daley dribbles as Ridgefield's Kurt Steidl reaches for the ball during Tuesday's class LL semifinal game at Wilby High School in Waterbury on March 15, 2011. Fairfield Prep's Terry Tarpey takes a shot as he is fouled by Ridgefield's Andrew Barton during Tuesday's class LL semifinal game at Wilby High School in Waterbury on March 15, 2011. Fairfield Prep's Terry Tarpey takes a shot as Ridgefield's Mike Kenny defends during Tuesday's class LL semifinal game at Wilby High School in Waterbury on March 15, 2011. Ridgefield's Mike Kenny takes a shot during Tuesday's class LL semifinal game at Wilby High School in Waterbury on March 15, 2011. Fairfield Prep's Alex Heiman takes a shot during Tuesday's class LL semifinal game at Wilby High School in Waterbury on March 15, 2011. Fairfield Prep fans support their team during Tuesday's class LL semifinal game at Wilby High School in Waterbury on March 15, 2011. Ridgefield's Seth von Kuhn scores three points during Tuesday's class LL semifinal game at Wilby High School in Waterbury on March 15, 2011. Fairfield Prep's Matt Daley takes a shot as Ridgefield's Mike Kenny defends during Tuesday's class LL semifinal game at Wilby High School in Waterbury on March 15, 2011. Fairfield Prep coach Leo Redgate cheers for his team during Tuesday's class LL semifinal game at Wilby High School in Waterbury on March 15, 2011. Ridgefield's Bryan Galvin takes a shot as Fairfield Prep's Alex Heiman defends during Tuesday's class LL semifinal game at Wilby High School in Waterbury on March 15, 2011. Fairfield Prep's Robbie Bier takes a shot as Ridgefield's Seth von Kuhn defends at the halftime buzzer during Tuesday's class LL semifinal game at Wilby High School in Waterbury on March 15, 2011.